Broken bones always seem to be a childhood injury and something that goes away as we reach adulthood. Unfortunately, we do not grow an immunity to broken bones, and severe accidents can easy result in various stress fractures or other types of severe broken bones. If you or a loved one have received a broken bone after an accident, it is important to speak with a knowledgeable Miami broken bones lawyer as soon as you are able. You may be entitled to bring a claim for damages against the person who caused the accident. Comminuted fracture – break in which the bone shatters into three or more pieces. The type of fracture or break is dependent on the type of impact. If the bone was only slightly tweaked, then it may have only cracked, rather than experienced a complete break. A closed break is when the bone stays inside the skin. However, if the bone pierces the skin, the fracture becomes an “open” break and is a very serious situation. Recovery after an accident resulting in broken bones depends upon the bone which is involved. Many people are able to simply have a cast put on the limb which experienced the break, although others may require months of physical therapy to regain use of the limb. In more severe cases of breaks involving dangerous locations, such as the back or spine, the recovery period may be extended, and could have a lasting impact on the victim. The victim’s age will have a great impact on the length of recovery, and even if recovery is an option (in extreme situations). However, the severity of the injury will dictate the terms of a personal injury claim, and not the “normalcy” of the accident. A so-called routine car accident which severely injures an elderly driver who might have weaker bones than a 30-year-old will often lead to a higher claim for damages. The negligent driver should not have the ability to contest the personal injury claim when they were at fault for the accident. Broken bones can have a tremendous impact on the victim’s daily life and will require a complete reworking of how they get to work, whether they can continue working, and simply running errands. The negligent driver, or other party who caused the accident, should be held accountable for the pain and subsequent struggle a victim must endure after such an accident. 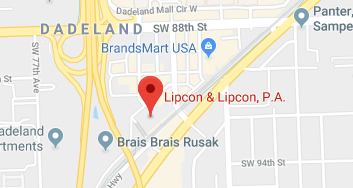 If you or a loved one have received a broken bone in an accident and have questions regarding your ability to recover a settlement, do not hesitate to contact the attorneys of Lipcon & Lipcon, P.A. Our Miami personal injury lawyers have over 60 years of combined experience in assisting our clients with their accident and injury claims relating to broken bones and other serious injuries. Call our office at 305-670-6144 or contact us online today for your free initial consultation.